This Christmas I was meeting my partner's family for the first time and was stuck on what to get them, especially the ladies. Originally, I'd thought of giving them each one of my clutches, but having never met any of them, wasn't completely sure my style was there style, or that they were even the type that liked clutches to begin with. Around the same time, I was contacted by Ethical Box to see if I'd be interested in selling my clutches on their site. Always one to procrastinate the task at hand, I spent then following hours exploring every inch of their site and it was though this deep creeping that I discovered Sashka Co.
Their bracelets are handcrafted by artisans in the Kathmandu Valley of Nepal and purchased for fair trade prices from the artisans themselves, empowering Nepalese artists, especially Nepalese woman, to rise above the poverty line and encourage sustainable development within the community. 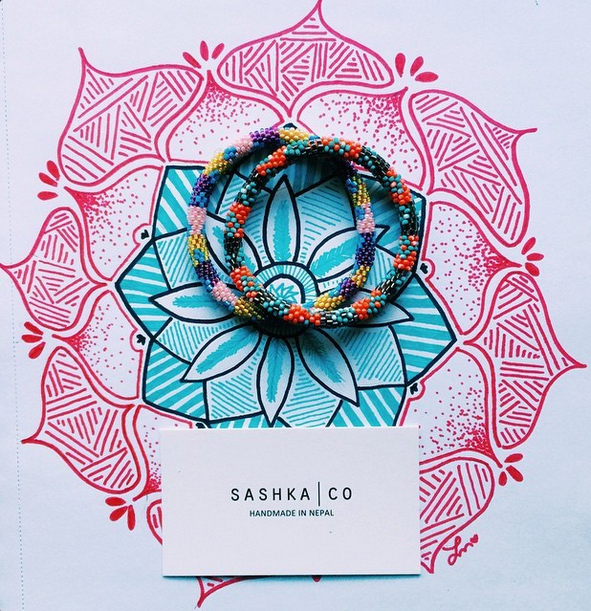 I've long been a fan of giving friendship bracelets as the gifts to a new friend or family member and had recently committed to buying strictly fair trade, eco friendly goods, so Sashka Co met my mood magnificently, and I immediately ordered three.